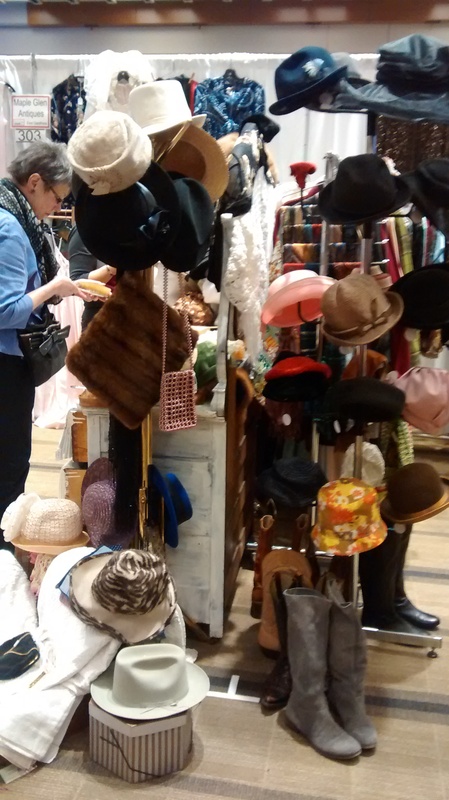 So yesterday afternoon, a friend of mine and I attended the Toronto Vintage Clothing Show. They hold it twice a year in the Toronto Metro Convention Centre, once in September and once in March. I signed up for email notifications back in the fall, so a week before the show I received a coupon for $2 off admission – a perk of being a subscriber to the event. Regular admission is $10. There were so many booths we honestly had no idea where to start. Finally we just picked one and tried to wrap a square around the room, and then weave in and out between the aisles. I was amazed at all the variety. 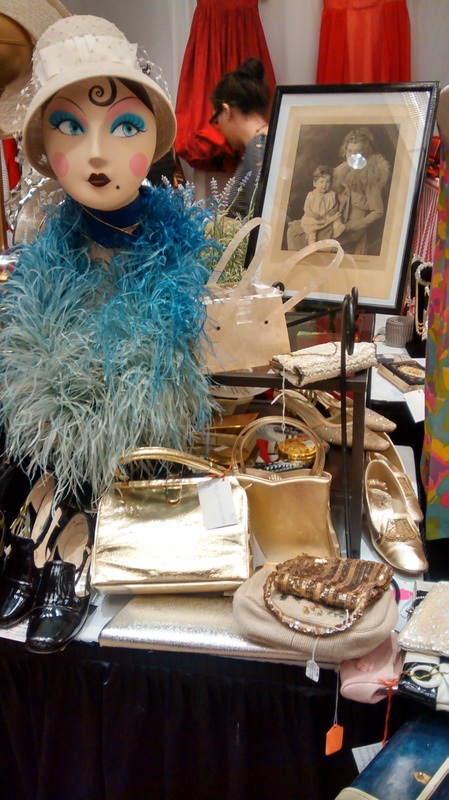 One booth sold strictly vintage designs of famous designers – Dolce and Gabbana, Betsey Johnson, and Valentino, just to name a few. Not to mention, all clothing was 50% off the ticketed price at that same booth! One of my favourite booths had to be one that sold almost exclusively jewelry. Better yet, it was cheap! 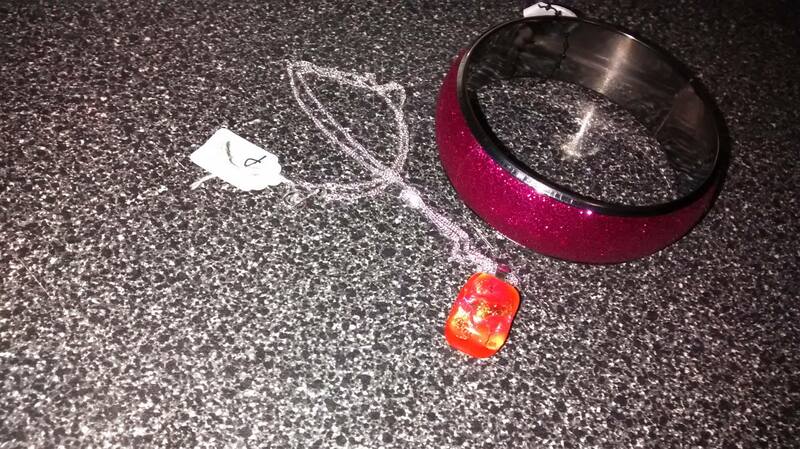 I scored a lovely necklace for $14 and a pink glitter bangle for only $4! I also came across this crazy shirt at one of the booths. 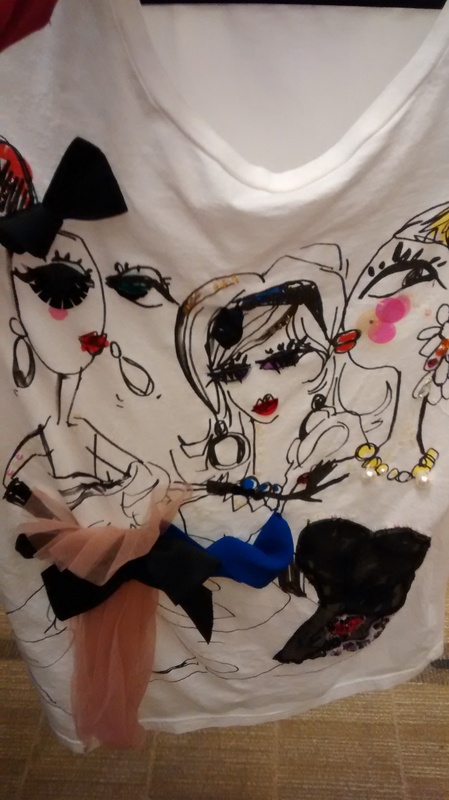 I didn’t buy it, as it wasn’t my style, but this is a piece from a collaboration between Lanvin and H&M. It had all sorts of embellishments and extra details on it – the eyelashes are sequins which are partially sewed on, so you can move them around if you want to! I just found this really interesting and wanted to share it with you guys. 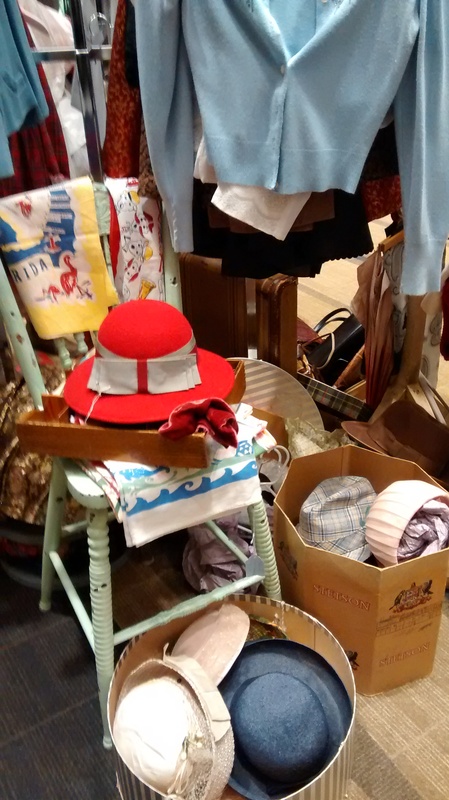 Another vending was selling vintage clothing and handbags, but there was also a crate of old advertisements and magazine spreads taken from vintage issues Vogue, Harper’s Bazaar, and more. I fell in love with the fashion pages, but unfortunately couldn’t take all of them home with me! So I settled for this absolutely stunning photo featuring a sleeveless fur housecoat by Mainbocher, from the October 1937 issue of Vogue. 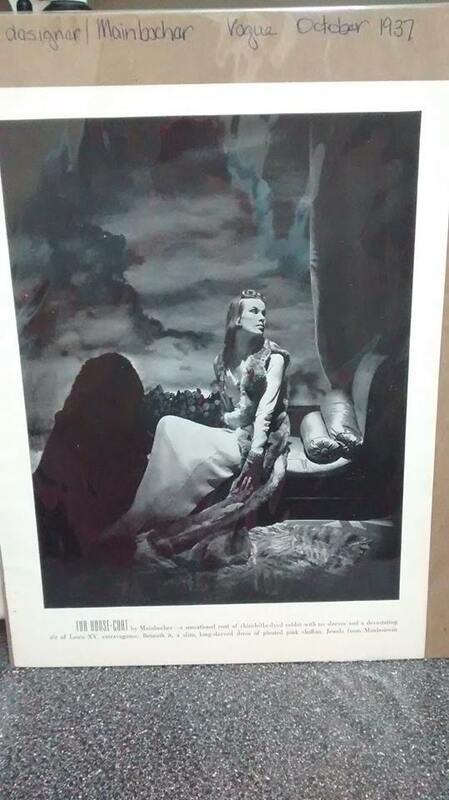 Now all I need is to find the perfect frame for it! These are some photos of some of the vendor layouts, and the items they had for sale. 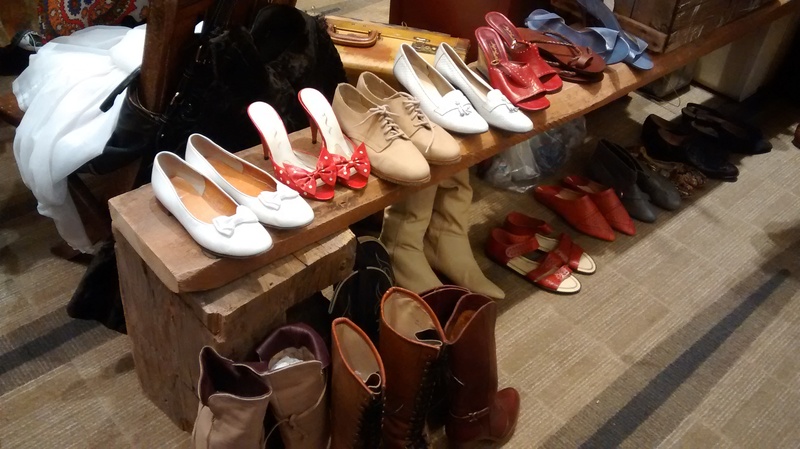 Lots of shoes and handbags! I didn’t end up purchasing any clothing myself, because as luck would have it, everything I fell in love with was either too big or too small! 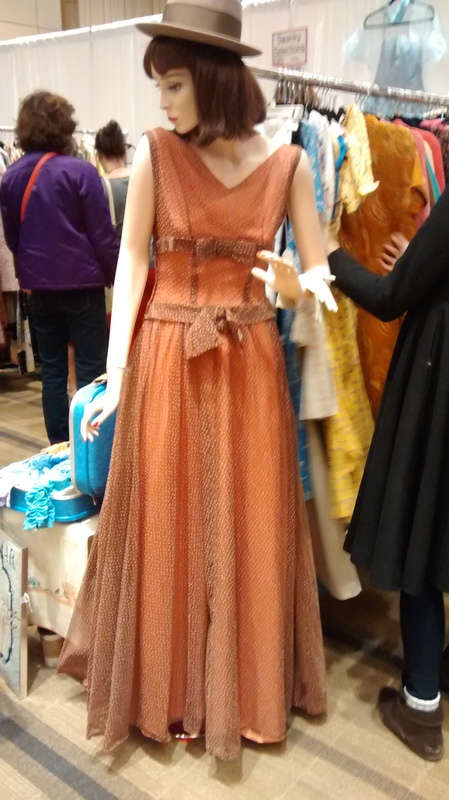 Such is the way of vintage shopping, unfortunately. But the two items I WOULD have gotten, had they fit, were both skirts. One was a deep blue suede, pencil-skirt style, with a small slit in back. The other was a 60’s-style miniskirt, and let’s just say that ‘mini’ was definitely the right way to describe the length – it was supershort! The skirt was a lovely teal hue, and had two black squared pockets on the front. Maybe next time I’ll have better luck with sizes. 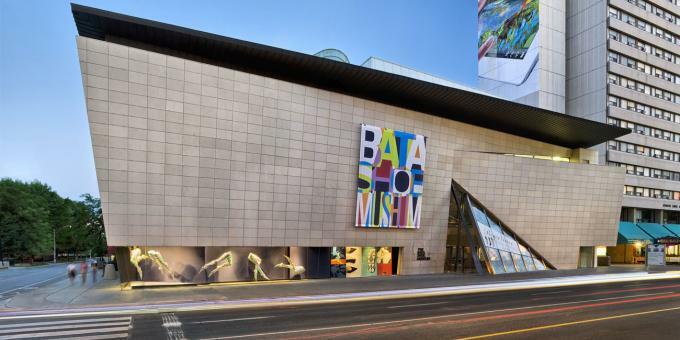 On Saturday, I headed downtown to check out the Bata Shoe Museum with a friend of mine. I had been once before during the Nuit Blanche festival in 2010, but with ever-changing exhibits and accompanied by someone new to Toronto, I thought I was due for another visit. For those of you who haven’t been, the museum is located on Bloor Street, near St. George subway station. It is visually stunning from the inside and out, and the exhibits are both informative as well as interesting. 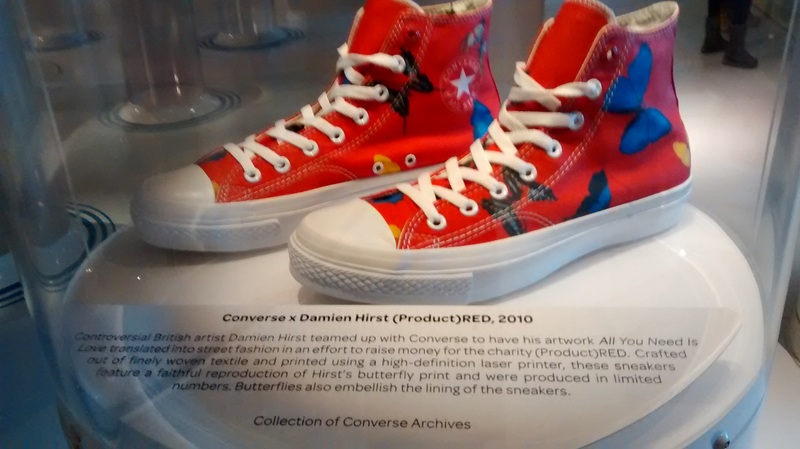 My favourite part of the museum is, of course, the celebrity shoes that reside there – these are my favourite celebrity shoes in the current exhibit. 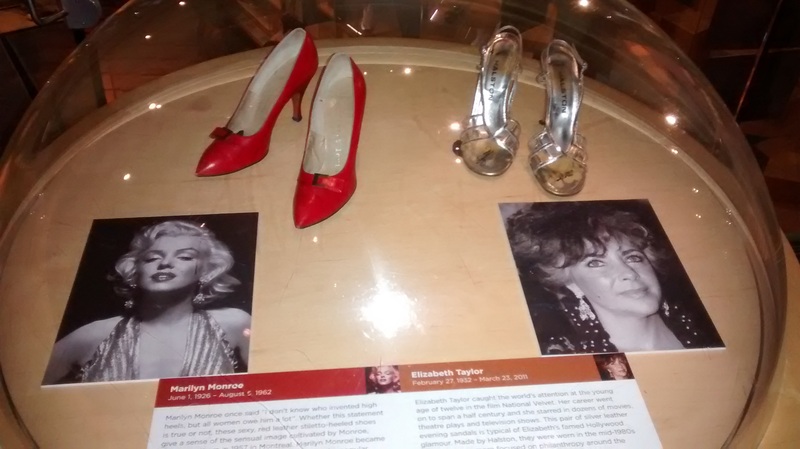 Just like many stylish women, Marilyn favoured a classic red pump. Elizabeth Taylor was a shining star on the silver screen, and definitely worked that in this strappy silver pair. 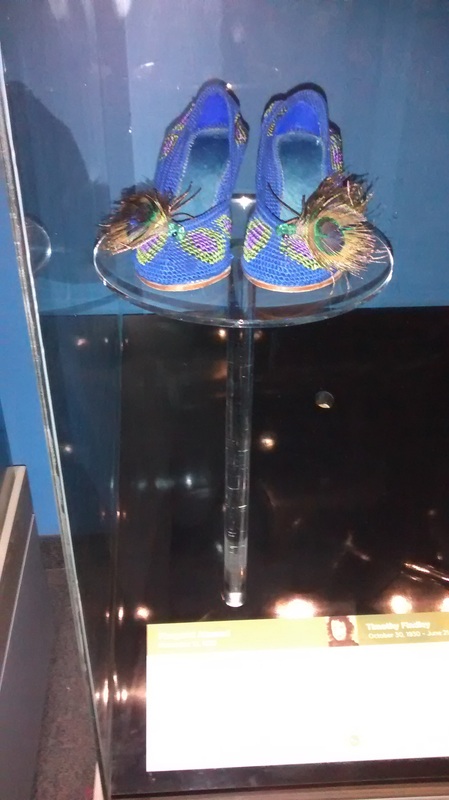 I was awed to see Margaret Atwood’s heels as a part of the exhibit. The woman is a personal inspiration to me, as well as many other people I know. I was extremely pleased to see her being acknowledged on the same level as movie stars and musicians, for I feel she is an extremely important contributor to society. 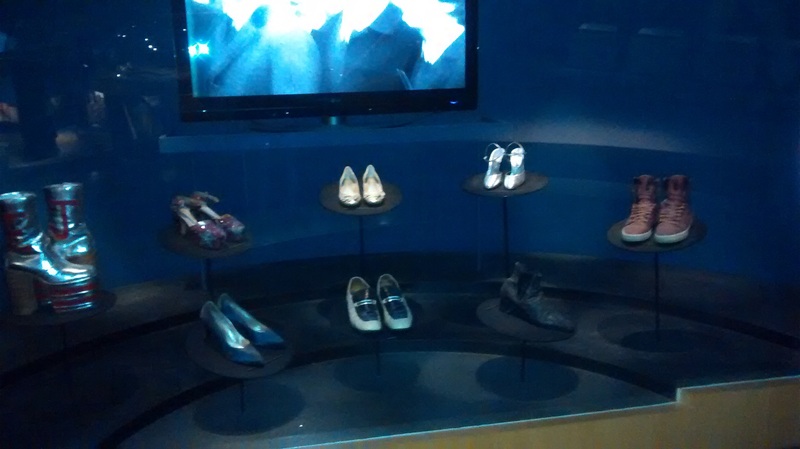 Now, here we have a case of shoes belonging to famous musicians throughout history. Unfortunately, they didn’t seem to be laid out in any specific order, so it was a little hard to tell what shoes belonged to which star… although some were dead giveaways – hello, who but Elton John would wear those platform boots? 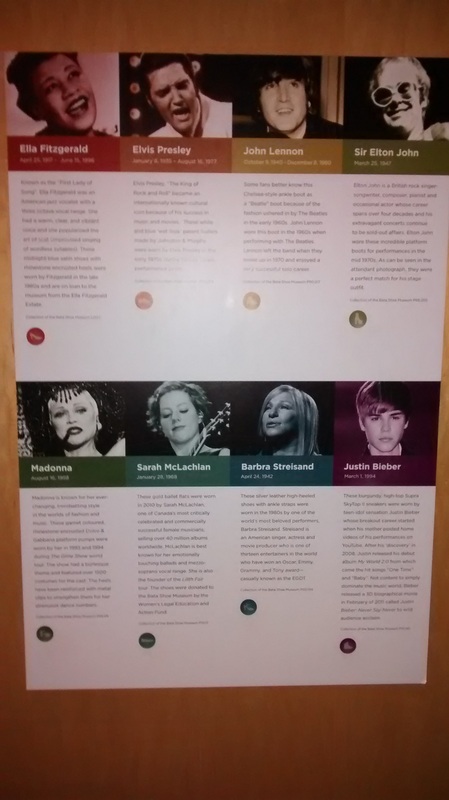 I’m also going to take a moment here to raise my eyebrow over the fact that Justin Bieber is being featured in such a prestigous exhibit. The “work” he has done (and I use the term ‘work’ loosely) is nowhere near parallel to that of the other people you see in this case. Alas, I am not the museum curator, and so I will be moving on now. 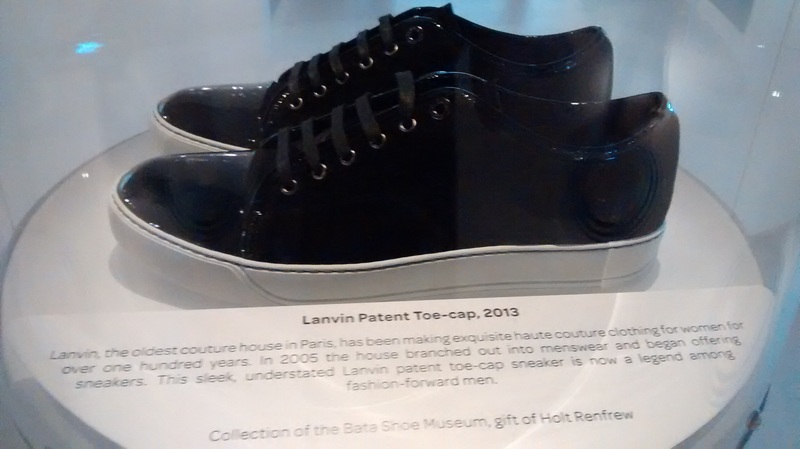 Bata’s newest exhibit in the museum is currently “Out of the Box: The Rise of Sneaker Culture”. I couldn’t resist taking a peek despite sneakers not being my thing, and there were actually some gorgeous designs! Here are my top 4 favourite sneakers from the showcase. I am a HUGE Louboutin fan, so it’s no surprise I was drawn to these spiky sneakers. With the shining gold colour and edgy embellishments, these shoes are sure to turn heads wherever you go. As far as sneakers go, if I have to wear them, I go Converse every time. While I tend to favour the basic black, I found this butterfly design incredibly appealing. I find butterflies to be delicate yet complicated, and intrinsically beautiful (I even have a butterfly tattoo). Overall, I find these sneakers to be really cute. Jimmy Choo is another favourite shoe designer of mine. I tend to wear more black than other colours, so this is why I was led over to this pair originally. However, the paisley print and the female silhouettes were what made me fall in love. 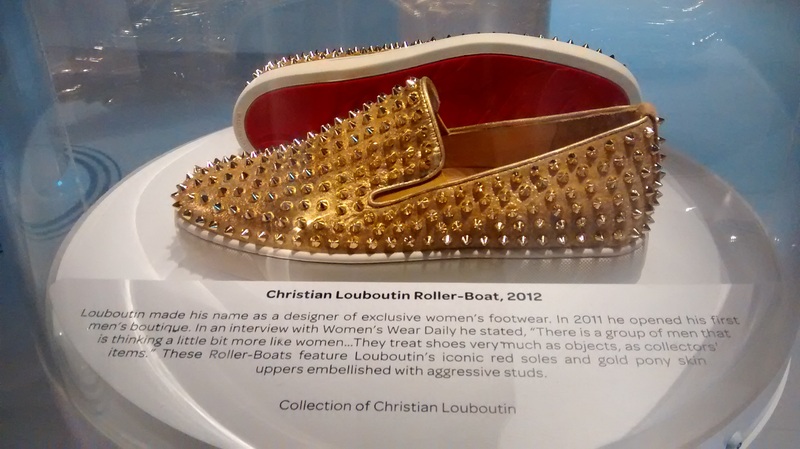 Although the sign states that the sneakers are ‘unquestionably masculine’, I would wear the heck out of these! And lastly (but certainly not least), we have the Lanvin sneakers. The patent leather provides a glossy sheen, and the basic black makes them easy to go with everything – if only they fell into my price range! I never thought I would be able to categorize a pair of sneakers as classy, but now I know it only takes one exceptional designer to change the course of style history. That concludes my afternoon at the shoe museum. If shoes are your thing (and really, aren’t they every woman’s thing?) then you should definitely check it out. There’s more stunning shoes and shoe history where all of this came from!